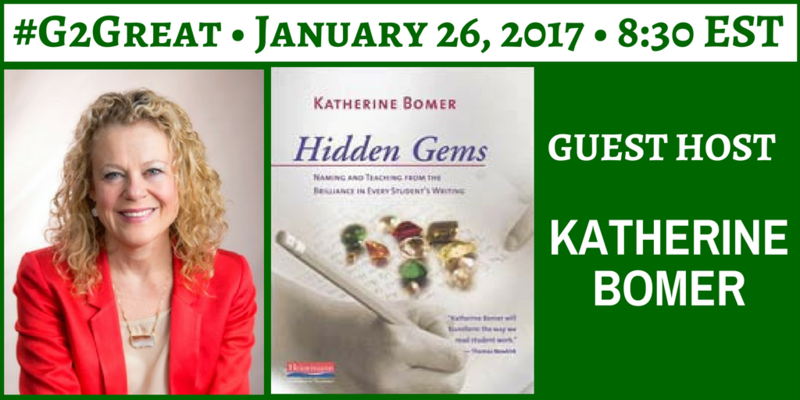 On January 26, 2017, #G2Great enthusiastically welcomed Katherine Bomer to our Twitter home. Our enthusiasm was obviously shared by a multitude of educators who have been collectively inspired by Katherine’s beautiful book, Hidden Gems: Naming & Teaching from the Brilliance in Every Student’s Writing. As educators who are committed to the success of our students, we are resolute in our belief that each child is worthy of celebration. We tuck appreciative ‘love’ dust into our back pocket reserved for any child who happens to be in our presence, secure in the knowledge that their hidden gems are awaiting discovery. Our celebrations are not reserved for a select group of children because their writing “earns” our appreciation but for EVERY child because their writing “deserves” our appreciation. Each child brings a unique writing fingerprint to the experience. These distinctive imprints range from hidden gems just out of view to those that beckon us to move beneath the surface until we find them. We recognize that there will be different ‘levels of hidden’ but know that a gem is always there even if it is not immediately visible to us. Our commitment to find those gems drives us to look, read, and search until we do. And when it feels hopelessly out of view, we call on our fellow gem seekers because we know that they are likely to see what we cannot. While celebrating “sweet, quirky, moving writing” is at the heart of hidden gem seeking, we know it’s about so much more. We do not celebrate a product by viewing writing as surface level marks on a page, rather celebrating the process that gave meaning to those marks and why that meaning touched us in the first place. We know that it is this process that will enrich our teaching and thus student writing so we make children privy to the process in order to elevate the very thinking that will elevate our own. This writing process initiates deeper conversations with children so the thinking behind the hidden gems illuminates pathways to new opportunities to impact future gems worth celebrating. The hidden gems in student writing stretch beyond the writing because they reflect our desire to recognize and acknowledge the wonderful things children are already doing at that moment in their writing lives. Looking for the writer’s NOW hidden gems sharpen our lens to support the writer’s LATER hidden gems. Zooming in on those gems today allows us to name glimmers of brilliance in the moment to set off a domino effect for new gems in the moments ahead. We use these hidden gems to create a series of stepping stones that will inevitably lead children to new possibilities in the next piece and the one after that. Each minute we are fortunate to spend in the company of children is a gift wrapped in a precious package of opportunity. This gift allows us to change places with students as we become the student and they become our teachers. As we look at their writing, we get a glimpse of the hopes, fears, dreams and joys that exist both within and beyond our walls. And as a result, we don’t just come to know their writing but to understand who they are as humans. Those glimpses help us see the writer behind the writing and our personal and professional lives are enriched because they shared their lives with us. Teachers who celebrate the hidden gems in student writing seek to constantly plant new seeds. We accomplish this by gathering beautiful books by authors who become our co-conspirators. We invite them into our room through their books because we know we can join hands in our efforts to inspire hidden gems yet to come. With each collaboration we gain new understandings about the writing and the writer in front of us and we apply these understandings in ways we could not possibly have envisioned alone. As teachers and authors merge their efforts, we plant new hidden gem seeds lovingly beneath the writing soil until the next reading where we can celebrate anew. I can’t help but wish that every teacher would print Katherine’s beautiful words so her message would be in view each time we linger beside a child and a piece of writing. When we seek to “intentionally find something to love’ we embrace a mindset that allows us to continuously expect the unexpected. We know that each time we look closely at a piece of writing from the heart, we will see the writer and find hidden gems to celebrate again and again. And our love affair with student writing then leads us to new possibilities that will enrich the lives of both students and teachers! 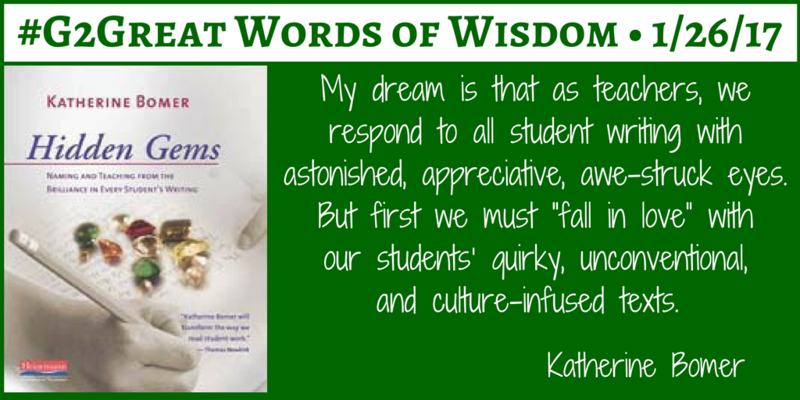 Katherine’s book is a virtual call to arms and teachers are ready to heed that call in a passionate quest to find and celebrate the hidden gems that reside within our students’ writing. Katherine implores us to uncover the beauty in their writing, holding their hidden gems in our hands so that we can put them on display for children to enjoy as much as we do. And in doing so we instill a shared sense of joy as we both look at writing with “astonished, appreciative, awe-struck eyes” in a mutual celebration. That vision is definitely worthy of love. 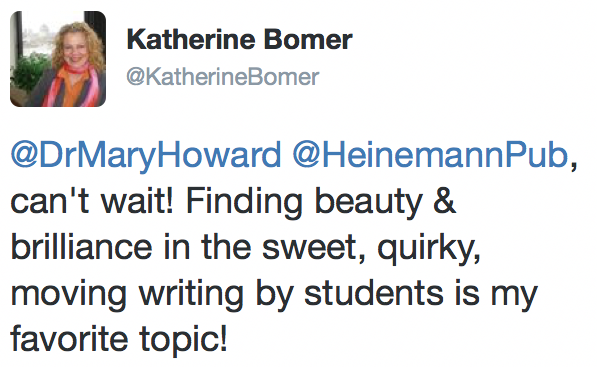 The entire #G2Great family is grateful to Katherine for inspiring a celebratory journey where each of us will continue to uncover hidden gems in student writing everywhere. 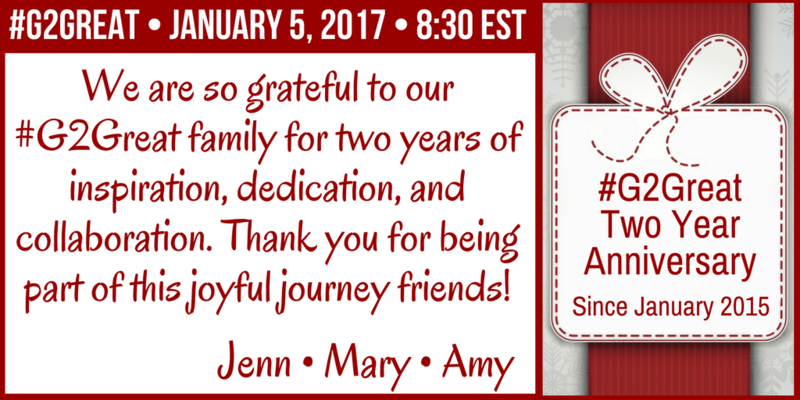 On January 19, 2017 #G2Great welcomed Clare Landrigan and Tammy Mulligan( @ClareandTammy ). We learned alongside our #G2Great community about Assessment in Perspective and we discussed topics related to their book by the same title. In the book, Clare and Tammy begin the preface with a quote from Maya Angelou that really speaks to perspective around assessment and how important the human factor is when interpreting data. Understanding the purpose behind anything that we are engaged in is critical for success. Assessment is no different — all stakeholders, teachers, parents and most of all our students should know why we are engaging in a particular assessment. When the purpose isn’t known to those involved in the assessing, the data is no longer reliable. When we consider the purpose we also have to consider that there many factors that go into the performance a child has on a particular assessment. Think about physical and mental factors that can interfere with a test sleep, diet and mood can greatly alter one’s performance. Home and school factors can also impact performance, but if the stakeholders, teachers, students and parents know the purpose of the assessment Collectively they can support the whole child by ensuring that the optimal conditions are present when a child is assessed, but this can only happen if there is an understanding and a shared value in the purpose. We, as educators need to push beyond the numbers and listen to the stories of our students. In a time when assessment and data can be so overwhelming to us, it is comforting to see so many educators who see beyond the numbers. They not only see the name, they see the face, they hear the voice and they hold the hand of our precious learners as they grow because we are assessing with a purpose and they are holding tight to meaningful data. Assessments must be authentic. This means that assessment and instruction are connected. Instruction cannot be without assessment and assessment without instruction, they are two halves of the same whole. If we expect assessment to affect instruction it must be authentic. It should be connected to the learning that is actually happening in the classroom. The gradual release of responsibility model that we use in our reading and writing minilessons offers us authentic opportunities to observe our students in the act of learning, we can see how they apply the new learning. At first with a partner and then alone. These authentic assessment opportunities allow students to engage in classroom discussion, provide opportunities for teacher clarity and feedback while generating an authentic formative assessment while students are in the act of learning. If we look to John Hattie’s research we can see that these instructional practices have a significant effect size on learning and they are authentic! During the chat, so many educators voiced these ideas throughout the chat. As Cathy Mere pointed out, “Assessment is the arrow that keeps us moving forward.” It is important for us to remember that the arrow has to have a purpose or direction and be meaningful and authentic in order to stay its course and move forward. 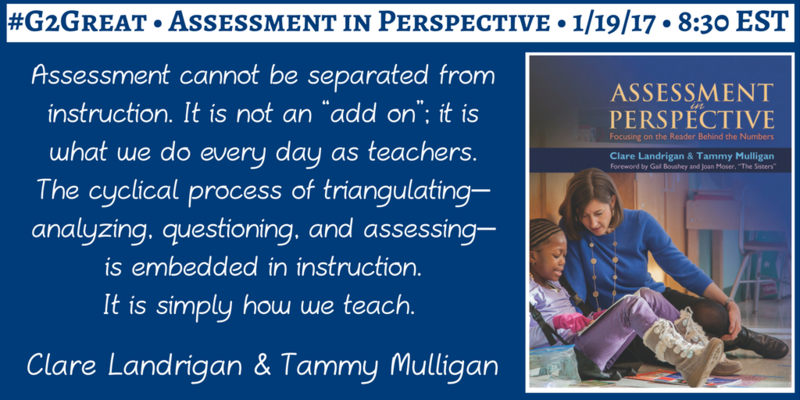 If you want to learn more about Clare and Tammy’s perspective, visit http://assessmentinperspective.com and buy a copy of their book Assessment in Perspective from Stenhouse Publishers! Thank you to Clare and Tammy for chatting with us! Thank you to Stenhouse Publishers for providing books that lucky chat participants were able to win in our raffle! Thank you to our #G2Great PLN for joining us each and every week as we chat, think and learn together! It is always better in your company! Click here for the Storify archive of this chat! On January 12, 2017 #G2Great opened up a conversation that allowed us to find a Common Ground for Beliefs, Collaborations, and Compromises. With every good conversation it has become clearer to me that Twitter is a vital tool for educators. I say this because it offers a free public forum that promotes professional engagement and growth. Educating our nation’s youth is a nuanced and complex endeavor. We will never agree on one way for teaching and learning. The reason is that there is no simplistic “one way” to teach. Teaching and learning is sophisticated work and cannot be boiled down to formulaic rituals. Beliefs intentionally help us define why: What is my why? Collaboration opens us up to innovation: How can I embrace innovation? Compromise necessitates shifting perspective: How can I learn from another to inform my next move? Chances are if you’ve read this post you are already a connected educator, You are leading by example so we thank you for your dedication and service. You are supporting the same kinds of professional constructs that our students are sure to inherit in an increasingly connected world. We need you now more than ever. According to Current US Poverty Statistics: “The official poverty rate is 14.5%, meaning 45.3 million people in the US live … More than 1 in 5 children in America (21.8%) are living under the official poverty line.” One thing we can all agree on is that all children have a right to a quality education – and teachers are our first line of defense. Poverty is not an abstraction for teachers. Its impact is revealed to us through the more than 1 in 5 children who come to school each day and depend on us to do the right thing in their name. Teachers are leaders and we need to sound the call and encourage our colleagues to take action. Get connected. Get engaged. Be prepared to push yourself out of your comfort zone. It does not matter if we all agree. The real heart of the matter is that we keep the conversation going. This date is forever imprinted on my heart because it literally changed my life by filling a professional and personal void I never even knew existed. Although the original plan was to discuss my book for several weeks, it didn’t take long before Jenn, Amy and I realized that #G2Great had magically morphed into something we could not possibly have anticipated – a transformation that continues with each chat. 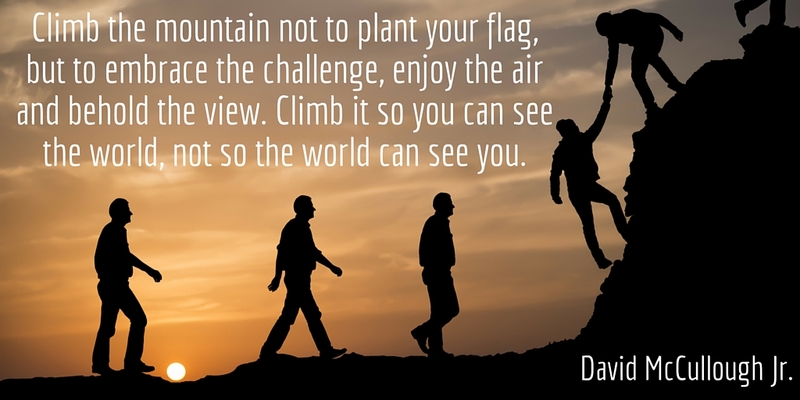 The mountain analogy has been a recurring #G2Great theme since our entry into Twitter. From the beginning, Amy, Jenn and I envisioned a place where we could stand side-by-side with dedicated educators shouting our deepest beliefs from the highest professional peaks in joyful harmony within a never-ending discovery process that would lead us to our best selves. This vision has inspired us to continue our shared labor of love, but we are well aware that #G2Great is only a hashtag without each of you. You appear on my twitter screen week after week as you raise glorious collective voices in honor of this wonderful work we are so blessed to do. ­You reflect an inspiring array of grade levels including teachers, principals, college students, professors, authors, presenters, parents and yes, even high school students (special shout out to our amazing #BowTieBoys). You breathe new life into #G2Great every week with unwavering commitment to education and we are eternally grateful for your dedication. Twitter has come with a hefty dose of discomfort for many of us. I happen to have first hand knowledge of the sheer terror of entry into this strange new world. Yet you do it because you know that change is impossible behind closed doors. In spite of that, you made a choice to swing the Twitter door wide open with reckless abandon until scary unfamiliar begins to slowly dissipate from view. I can’t tell you how often educators have proudly announced their ‘lurker status’ before bravely sending out a white-knuckle tweet here and there until the words start to pour into a verbal frenzy with the rest of us. It’s a gift you give #G2Great in the name of kids. I consider myself somewhat of an expert when it comes to joy since I couldn’t face a single day without it greeting me at every turn. As a joy expert, I can say with the utmost of confidence that your joy oozes virtually off my twitter screen from the moment the chat begins until the moment it ends. In fact, it’s common for many of us to show up to the #G2Great party early and linger until we can bear to say a reluctant goodnight. We trend on Twitter each week because pure joy flashes across the #G2Great Twittersphere in such warp speed that most of us struggle to catch random tweets here and there to capture your joy. It’s a gift you give #G2Great in the name of kids. Tweet after tweet reflects your determined dedication to meet the needs of every learner in your care, regardless of the role you play. Yes, the occasional word of discouragement may rise from the screen carefully disguised between the lines, but it is always accompanied by utter commitment to finding a way to unleash that potential. With devotion to your professional responsibility to every learner, your words are never about blaming parents, peers, administrators, life circumstances or kids. Rather, your tweets reflect you steadfast commitment to do whatever it takes to make success for every learner a reality. No excuses or empty promises – just resolute purpose. It’s a gift you give #G2Great in the name of kids. As a literacy consultant who spends much of my time in lonely airports and hotels, I would be the first to say that we learn best in the company of others. Through #G2Great I am able to take each of you along for the ride and my life is brighter because you are in it. The #G2Great collaborative spirit is an amazing thing to watch each week. I never see one-sided conversations but purposeful interchanges measured by replies, likes, quote tweets and retweets with a multitude of heartfelt questions, ideas, responses, suggestions, photographs, links, titles, compliments or ponderings that always seems to find a listening ear. It’s a gift you give #G2Great in the name of kids. It’s quite obvious that none of you come to #G2Great because you believe you have all the answers (anyone who believes that clearly has a delusional sense of self). By contrast, you come because you know that our growth process is never done and that each of us must embrace our professional and personal quest to deeper understandings. You come each week with a hunger for new knowledge and deep desire to learn more in the company of others. You don’t come seeking perfection but with a growth mindset mentality that allows you to soak in every word as you immerse yourself whole-heartedly in respectful dialogue knowing that our differences have as much to teach us as our similarities: It’s a gift you give #G2Great in the name of kids. Each week I am struck by the sense of inspired curiosity each of you bring to whatever educational role you play. That curiosity about your learners is the fuel that keeps you committed to teaching and learning. You demonstrate in every tweet a myriad of instructional wonderings that have the potential to enrich your practices and that curiosity drives you to know more and do more. You do this not for financial gain, notoriety or to sell a product but for the sole purpose of enriching the learning lives of students in your care. Your sense of curiosity keeps you coming back week after week knowing that you will walk away better than you were when you came even if your question is still unanswered. It’s a gift you give #G2Great in the name of kids. And so in closing, I’d like to express deep gratitude to each of you on behalf of my co-moderators, Amy and Jenn. We are so honored that you have stood beside us on the #G2Great mountaintop during the past two years. Here’s to continuing our #G2Great journey together with new discoveries forever in our sights. Before you go, let’s take a little trip down memory lane with brief glimpses of tweets that inspired us from every week in 2016. Thank you for being the gift that keeps on giving, friends!